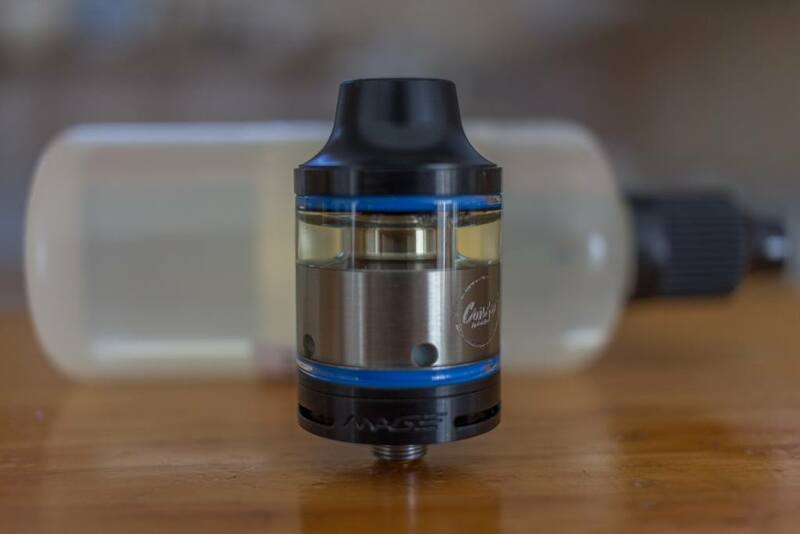 Mage RTA Reviewed - The Smallest 24MM RTA On The Market Today! Home → RBAs → RTAs → Mage RTA – Small, Powerful, with Great Flavor! Mage RTA – Small, Powerful, with Great Flavor! 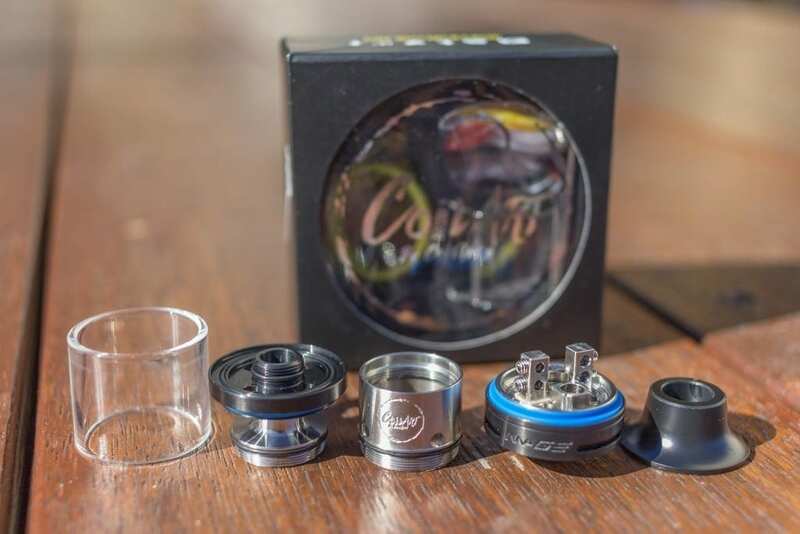 Today we will be looking at the Mage RTA which is the flagship offering from CoilArt. 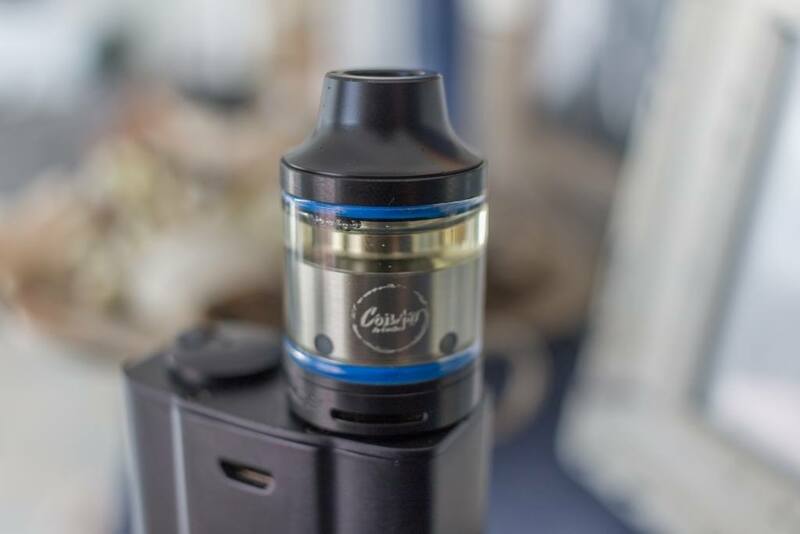 Marketed as the smallest 24mm RTA on the market, this tank is very quickly turning heads. Not just for the ease of building, but for the flavor, this is something you don’t want to miss. The Mage comes in at 44mm in overall height and sports a 3.5ml juice capacity. The tank is made from SUS304 stainless steel and features an easy top fill design. The velocity style deck has 8mm high posts with 2mm terminal post holes. The glass tank is made of Pyrex, which is noted from CoilArt as being food grade. The other features of the Mage RTA include a gold-plated 510 pin, a 510 compatible sloped delrin drip tip and adjustable air flow. When I received the small box, I was impressed with the packaging and what came out. Aside from the RTA, there was a spare glass section, a bag full of spares, an atty saver and Allen key. The spares bag contains extra grub nuts, o rings and extra seals. The seals, apart from the red ones that are already installed, come in blue, clear and yellow – which make for a very customizable setup. For such a light tank, the build quality is surprisingly top notch. Everything is machined to detail and fits perfectly together. The Pyrex is held in with the seals with just the right amount of pressure. The sloped delrin drip tip is very smooth, not jagged like a lot of machined delrin can be. The drip tip screws into the top part of the frame which houses the fill ports and chimney, which then screw into the chamber, which screws into the deck. The RTA was very clean on inspection and did not smell or have any remnants of machine oil at all. A big difference from a lot of big name tanks and RDA’s on the market these days. The airflow is split into three holes and the control ring does not spin endlessly. When turned, the airflow blocks off each of the 3 holes at the same amount across the board. The control ring stops at fully open or fully closed. It does not click into place, like some popular attys, but is easy to turn right off the bat. There is no resistance when turning, it just works and works well. The build deck is quite wide for an RTA which provides a very easy build platform. Probably one if not the biggest I have seen on an RTA to date. The familiar velocity style build deck makes for fitting your coils a very easy task. Once you unscrew the chamber from the deck, you will notice one standout feature of this RTA. The build deck spins and freely rotates in the base. It cannot be removed, like similar RTA’s, as it is captive in the base of the atty. The biggest setback of this is when you are pinching down your coils and pulling them tight with a mandrel or drill bit. I can see that some people would find this a pain when trying to build, however once you get used to it there is no problem. Speaking of builds, the first one I tried was a simple 24AWG kanthal 6 wrap 2.5mm dual coil build. This came in at 0.2ohms and was wicked with koh gen do cotton. Running at 50 watts, the flavor just blew me out of the water. The draw fully open is a little more restricted than an RDA, but it is airy enough to satisfy for a tank. Being such a confined chamber and chimney, the flavor definitely compares to an RDA, which was the pleasing surprise. The vape i would describe as being thick and dense. The vapor production does not compare to an RDA, but is certainly not lacking by any stretch. Next I applied a 26AWG 316L/32AWG kanthal dual clapton 6 wrap 2mm build, which came out to be 0.14 ohm and was wicked with rayon. This build took things up a notch in both vapor production and flavor. The clouds were denser and I was picking up those subtle nuances in the e-liquid that you don’t usually get from a tank – usually only from a good RDA build. Wicking the Mage RTA is super easy. Once your wicking material is installed, you leave it long and bring it all up to a point so the chamber can fit over the top. Once the chamber is screwed down, you cut the wicks just a little higher than the top of the chamber. Once cut, separate the wicks back out and gently fold them down to the base of the deck. You don’t want to stuff them in, just place them down in there, ensuring they cover the wicking ports. Remember that juice needs to flow in and air needs to flow out, which his why you don’t need to stuff your wicks in there tightly. I haven’t experienced any leaking when wicking this way, but I am sure that if you use to less wick it will leak like a sieve. You will easily be able to gauge the amount of wick required when you see the deck design and wicking ports. It’s really a no-brainer. Keeping in line with the aforementioned wicking method, I have yet to experience a dry hit. 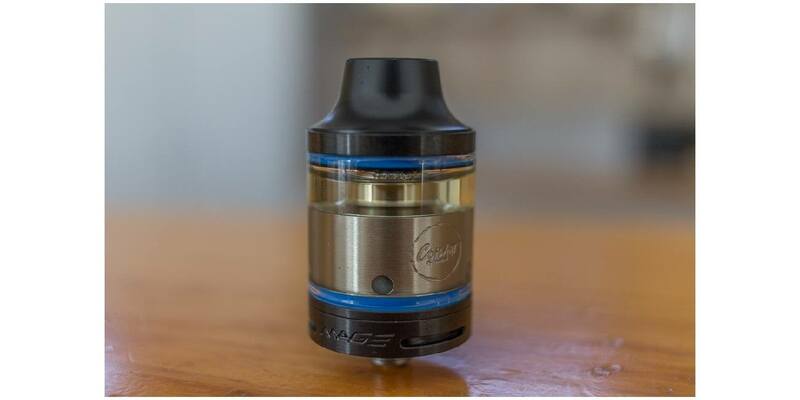 Given the efficiency of wicking, you do have to watch the level of liquid in the tank as you will go through juice quickly. The position of the wicking ports, straight to the wick, is a standout design feature of the Mage RTA. The filling process could not be easier. Once you unscrew the delrin drip tip, you will be presented with 2 kidney shaped fill ports. Simply fill from your bottle, screw the drip tip back on and your back in action in no time. Be sure not to screw the drip tip on too tightly, I can become impossible to unscrew if it is done up too tight. If this is the case, run it under some hot water to expand the metal and it will free up. The drip tip is really nice to use. The contours make great contact with your lips and it’s very comfortable to use. Even though you can fit your own drip tip into it, I find you don’t really need to, it’s just fine how it is. The tank looks good on most devices that can accommodate an atty larger than 22mm. I have yet to find a mod that gave poor fitment to the Mage and you can customize the atty to match your mod with the 4 color seal options if you wish. I also did not experience any ohm jumping or unexpected performance whatsoever while using the Mage. In summary, the Mage RTA, while not being a cloud beast is certainly a flavor machine. The satisfaction I get from the flavorful, rich dense vape makes it hard to put down. I just seem to keep going back to this tank time and time again, I can’t get enough. The ease of filling makes this atty an easy choice for me both at home and on the move. This is by far the best dual coil RTA I have vaped and I don’t hesitate to recommend this to anyone interested. Don’t think twice about picking Mage RTA today, it will definitely not disappoint. Well done on this one CoilArt. Thanks for this review. I’ve been thinking about purchasing one of these. And now after your review and talking about the amazing flavor, I believe I definitely need to get one of these babies. I just wish they’d bring one out that is 22ml instead of 24. Have you tried it on a joyetech evic VTC mini? How does it look? It does hang over slightly on the eVic Mini, but not a ton where it bothers me personally. Glad you liked the review!